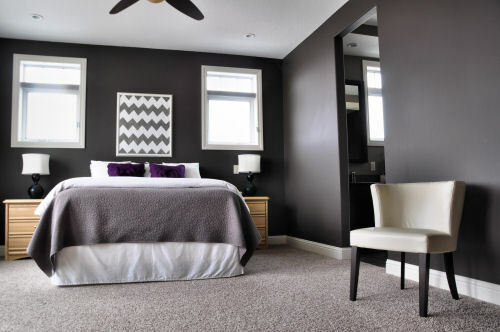 Although any room decorating is never finished, I have completed most of the projects for my 'operation:Master Bedroom'. You can check back at my inspiration and then plan for this space. Not bad really. Other than no headboard and a duvet cover that is 20" smaller that the actual duvet so bunches everywhere and doesn't adequately cover when sleeping, thus many cover wars. No the transformation did not happen overnight. Or over a weekend. In fact I have been working on this for over a month. This biggest job was stripping and refinishing the furniture - not only the two nightstands you see in this picture but also a large armoire. Then making the headboard and upholstered base, sewing the duvet cover and bolster, and redoing the lamps and shades. Yup - all DIY. I really like how the natural stump stools tye in with the new headboard. The updated end tables work great with the headboard thanks to my inspirational kitchen photo. 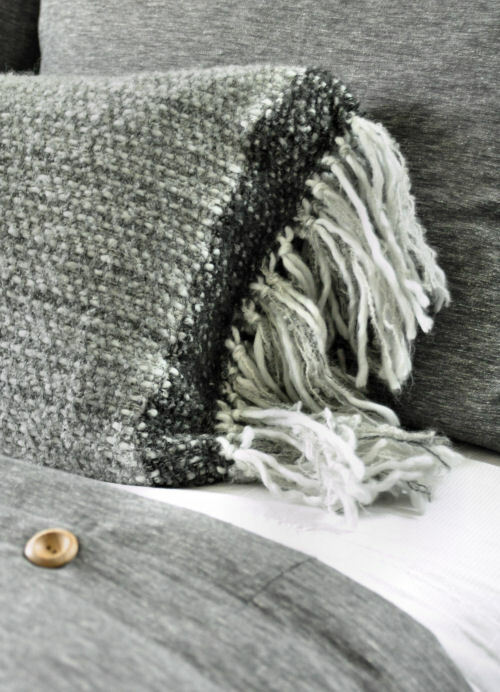 A close-up of the textures I used in the bedding. The small touch of the wood buttons also helps bring things together for me. And the lamps got a paint job and a new shade. Of course I'll be back with all the DIY details. 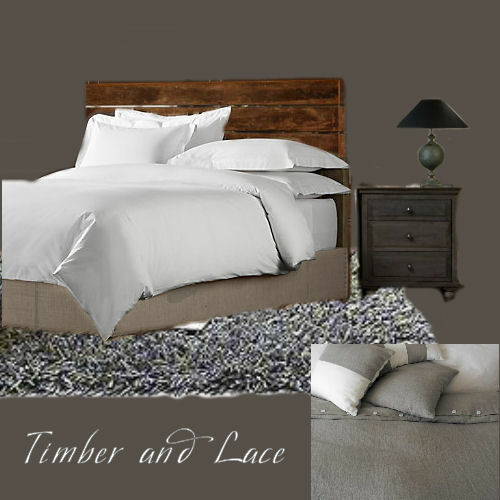 Building a timber headboard and upholstered bed. What I learned about stripping furniture. Painting the lamps and DIY wood shades. 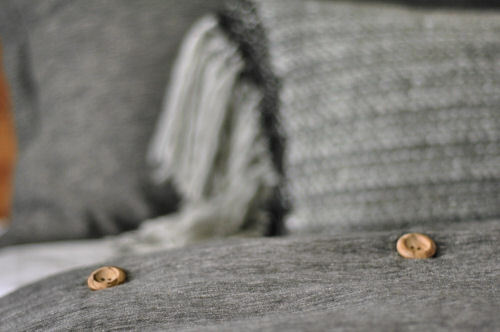 Sewing a bolster cushion from a throw blanket. Sewing your own duvet cover and shams. One more peak since I love our new room SO much. Of course it could use some window coverings and a sitting area still. I'll be waiting for inspiration and funds before I do any more in here. For now I'll just enjoy all that hard work. Your bedroom looks fantastic. 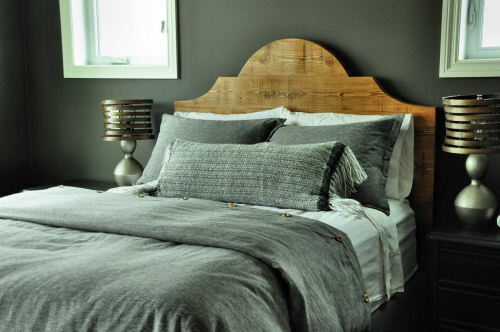 I love the warm wood headboard against the gray and all the other touches of wood carried throughout the room. I can't believe you did all that in a month. Well done. I'm just starting mine, but i"m having a hard time finding the time to get it painted. Wow, this is gorgeous! You are do talented! I can't wait to hear how you diy'd the duvet and lampshades. It's super super cute! I love it! Your pictures really make things pop too. I love, love, love it. Wow on the photography, too! Love your headboard! It looks fabulous! 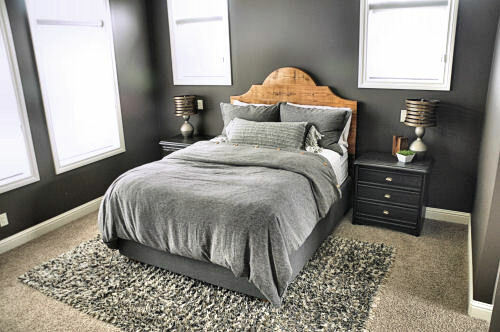 Oh wow what a gorgeous bedroom! 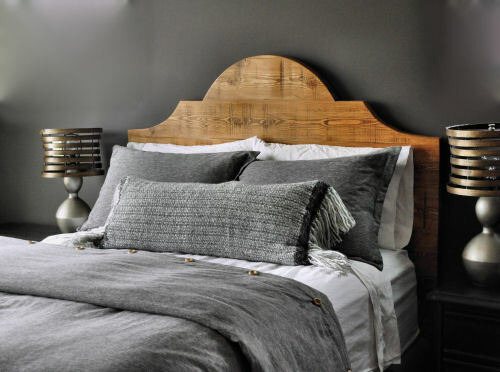 Love all the gray, and LOVE that headboard! Stunning!!! 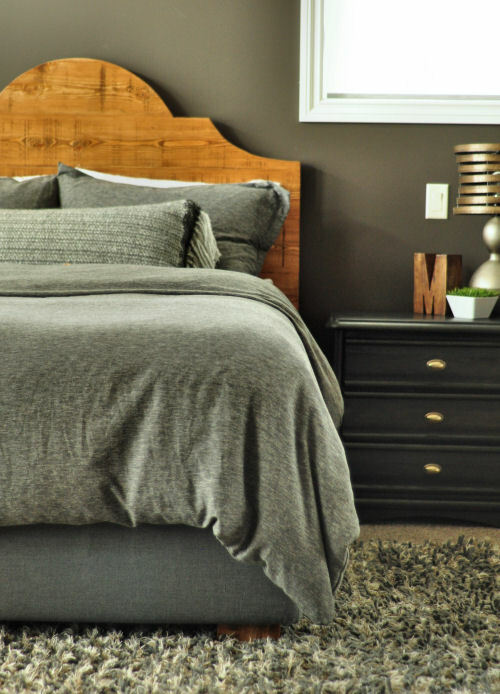 I LOVE the grey + raw wood combo! And that York headboard, I am SO in love! I can't wait to see the DIY! Wow! I'm so impressed. Count me as your newest follower. You master is really cool! I can't wait for the tutorials ... especially those lamps. Amazing! And, seriously, did you really, really make that headboard? I'm awestruck! Great material and space of the headboard! 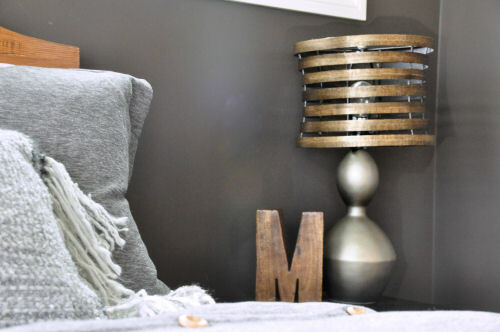 Wow, how this little accent of wood stands out in the grey. What a combination! I would never have thought of it and it is great!!!! True, your bedroom transformation is absolutely great since you were able to achieve a modern look especially with that elegant grey theme. 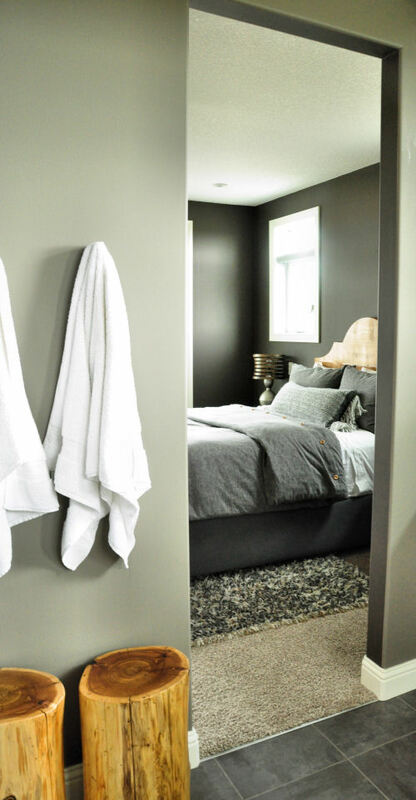 And aside from mattresses, comforters can add a more cosy feel so good job for grabbing that nice grey comforter. Thanks for sharing this amazing information about Timber floor sanding & polishing shellharbour it really heluful for me Timber floor sanding & polishing shellharbour. Really very helpfull!!! Mother of 3 blogging about creations at home. Ikea Desk transformation finally complete! !